The entrances he designed for the Parisian Metro system in 1900 made Hector Guimard an icon of French design at the turn of the 20th century. Between the 1890s and 1930s, Guimard designed buildings and objects for the public and private spheres, both large and small in scale. He is responsible for hundreds of decorative objects as well as over 50 buildings and interiors. A leading proponent of the German concept of gesamkunstwerk, his designs worked together to create harmonious spaces, from the outside in. If Guimard’s clients spent their waking lives surrounded by the stylized floral and foliate swirls characteristic of his oeuvre, why not also in the afterlife? This tombstone design seems to straddle Art Nouveau and le Style Guimard. 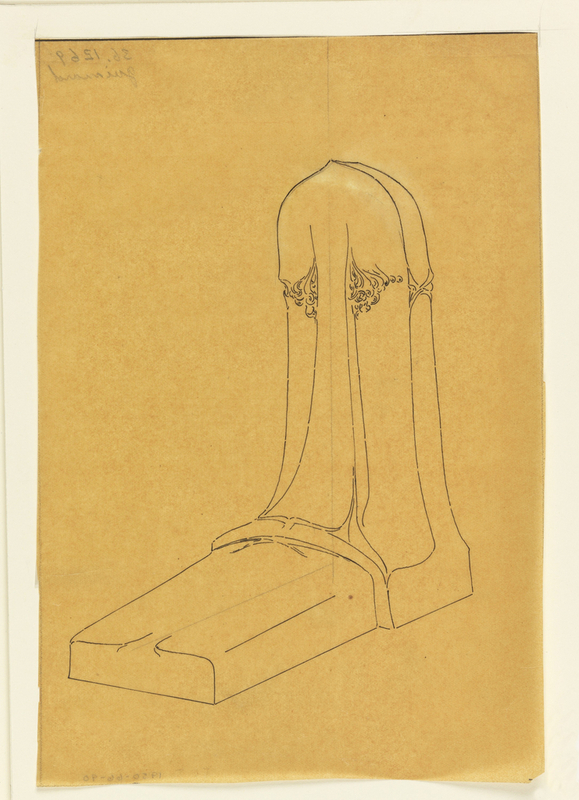 The form itself is clearly related to that of the 1925 Expo tombstone and a sepulcher made in 1922 for the French poet Albert Adès, with the rigidity of the arrangement only further emphasized by the barely-visible perpendicular guide-lines in pencil. In contrast, the headstone itself is more fluid, evocative of drapery that’s been pulled back where it meets the base, and it bears the curving and curling flourishes typically found in Guimard’s earlier work.